With two full days of the FIBA Basketball World Cup behind us, the groups are starting to take shape and there has been nothing to have caused the bookmakers any real pain so far. There haven’t been many shocks so far which means that in the main, the basketball betting tips have been true to form. Only one group has an outright leader so far and every group is shaping up nicely for some late drama with respect to qualification into the knock-out round. With day three only featuring teams from Groups A and B, day four is the chance for Groups C and D to catch up, before we race to the finish of the group stages on the 3rd and 4th of September. When it comes to excitement, you want to check out France in Group A. On the opening day of the 2014 FIBA World Cup, the French side lost out to Brazil by two points but on the second day, France got a win by defeating Serbia by a score of 74-73. Joffrey Lauvergne was the main man for France in this nailbiter of a match with 19 points. The top scoring Serbian player was Miroslav Raduljica who delivered 21 points and 7 rebounds. The other two games in Group A on Sunday the 31st of August, featured a big team versus a minnow, and the results panned out as expected. Brazil defeated Iran by a score of 79-50 with Alex Garcia grabbing 12 points. The host nation ran up another convincing win, this time against Egypt, by a score of 91-54. 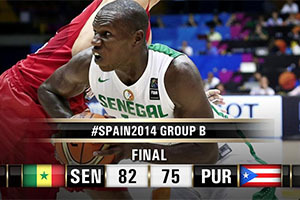 Serge Ibaka was on fire for the host nation with 18 points and 8 rebounds. At the close of play on day two, Spain and Brazil had four points, France and Serbia had three points and Egypt and Iran had two points. The teams from Group A have a rest day on Tuesday the 2nd of September, before coming back to play on the 3rd and 4th of the month to settle the group. Even after two games, the four qualifying spots are taken by the teams who are strongly tipped to make it through so there will need to be a shock along the way to take this group off course. The big story of the day in Group B is probably the fact that Senegal managed to grab their first win at a FIBA World Cup since 1998. This was achieved through an 82-75 win over Puerto Rico, with Mouhammad Faye grabbing 20 points. Faye was ably assisted by Gorgui Dieng who grabbed 1 points and 13 rebounds in the match. Croatia managed to pick up a 90-85 win over Argentina, even though the South American side had Luis Scola who delivered 30 points. Scola had a high scoring day on day one of the event as well, so he is clearly enjoying the tournament so far, although personal glory may not be as sweet given that his team lost. The sharpest shooter for Croatia was Krunoslav Simon, who picked up 18 points. This was a massive win for Croatia with many people predicting that this game was going to be a close one. In the other match in Group B, Greece managed an 82-70 win over the Philippines. Georgios Printezis scored 25 points for Greece while Andray Blatche offered up 21 points for the Phillppines, who are still looking for a victory. At the close of play on day two, Greece and Croatia had four points, Argentina and Senegal had three points and Philippines and Puerto Rico had two points. With a rest day on Tuesday the 2nd of September and two final games to come on the 3rd and 4th, there will be some must win games in the group soon. Team USA won again, if not as convincingly as some people would have predicted, while Finland and the Dominican Republic were toasting some tremendous results. The Dominican Republic victory over New Zealand was huge in terms of their qualification hopes and their 76-63 win could be crucial in terms of staying on in Spain a little bit longer. Francisco Garcia picked up 29 points for the winners, who will now be looking to consolidate their position in the qualifying berths. Finland can also take a great deal of pleasure from day 2 in Group C as they managed to defeat Ukraine by a score of 81-76. The top Finnish player was Shawn Huff with 23 points although Eugene Jeter picked up 24 points for Ukraine. A 98-77 win for Team USA over Turkey may not have been too convincing but a win is a win, which is certainly all you are looking for at this stage of the tournament. The American side impressed on day 1 but were pushed hard by Turkey. Kenneth Faried grabbed 22 points and 8 rebounds, ensuring that there were no slip ups at this stage. Team USA is already out in front with 4 points with four of the teams tucked in just behind them on 3 points. New Zealand is currently the trailing team on 2 points and play resumes for three days straight on Tuesday the 2nd of September. Group D ran to form, with Australia getting their campaign up and running with a steady win over South Korea. The 89-55 victory was marked by Joe Ingles grabbing 17 points. Slovenia defeated Mexico by a margin of 89-68 with the top Slovenian player being Zoran Dragic, who picked up 22 points. He was outscored by Gustavo Ayon, the Mexican player notching 23 points but of course, it is team glory as opposed to individual excellent that matters most at the FIBA World Cup. Lithuania grabbed their second win of the tournament with a 75-62 win. Angola’s Eduardo Mingas picked up 14 points and 9 rebounds but it was Donatas Motiejūnas, with 12 points, who was feeling happier at the end of the game. At the close of play on day two, Slovenia and Lithuania had four points, Australia and Angola had three points and Mexico and South Korea had two points. All of the teams are back in action on Tuesday the 2nd of September where they will play for three straight days to conclude their group stage.